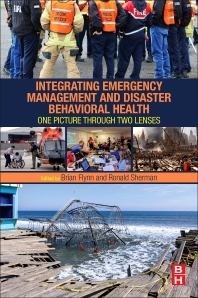 Integrating Emergency Management and Disaster Behavioral Health identifies the most critical areas of integration between the profession of emergency management and the specialty of disaster behavioral health, providing perspectives from both of these critical areas, and also including very practical advice and examples on how to address key topics. Each chapter features primary text written by a subject matter expert from a related field that is accompanied by a comment by another profession that is then illustrated with a case study of, or a suggested method for, collaboration. Chapter 7. What Can DBH Actually Do To Make Emergency Managers Jobs Easier? Dr. Brian Flynn is currently an Associate Director, Center for the Study of Traumatic Stress, Department of Psychiatry, Uniformed Services University of the Health Sciences (the nation’s military Medical School). Through his career he has had a strong focus on the psychosocial sequelae of large scale disasters and emergencies. During his 31 years in the United State Public Health Service, in addition to other responsibilities, he worked in, managed, and supervised the federal government's domestic disaster mental health program. In that role, he served on-site with emergency management professionals at many, if not most, of the nation's largest disasters When he retired from the USPHS in 2002 at the rank of Rear Admiral/Assistant Surgeon General, he directed nearly all of his professional efforts toward advancing the field of preparing for and responding to large scale trauma. He provides training and consultation to both public and private entities both nationally and internationally. Ron Sherman spent almost 29 years as an emergency management specialist with the Federal Emergency Management Agency. He worked on over 200 federal disaster operations, including some of this nation’s most devastating events. Many times during his career he was in the role of Federal Coordinating Officer (FCO), the on-site official in charge of all Federal response and recovery efforts. After Hurricane Katrina Ron served as the FCO in Alabama before becoming the Senior Housing Official responsible for disaster housing operations for the entire Gulf Coast. After retiring in 2007 he continued his emergency management involvement by starting a Citizen Corps Council in his hometown and is now the leader of a Community Emergency Response Team. He provides emergency management consulting services to communities and emergency response training for volunteer groups. He has successfully integrated the operations of a Community Emergency Response Team with a new Medical Reserve Corps team and made Psychiatric First Aid a requisite part of the training curriculum.